The holidays are always full of heightened emotions and expectations. Our culture readily celebrates the excitement, joy, and consumption of Christmas, but many of us also experience difficult feelings during this time of year. It is easy to get lost in the demands, activities, lights, shopping; the holidays can be quite stressful. 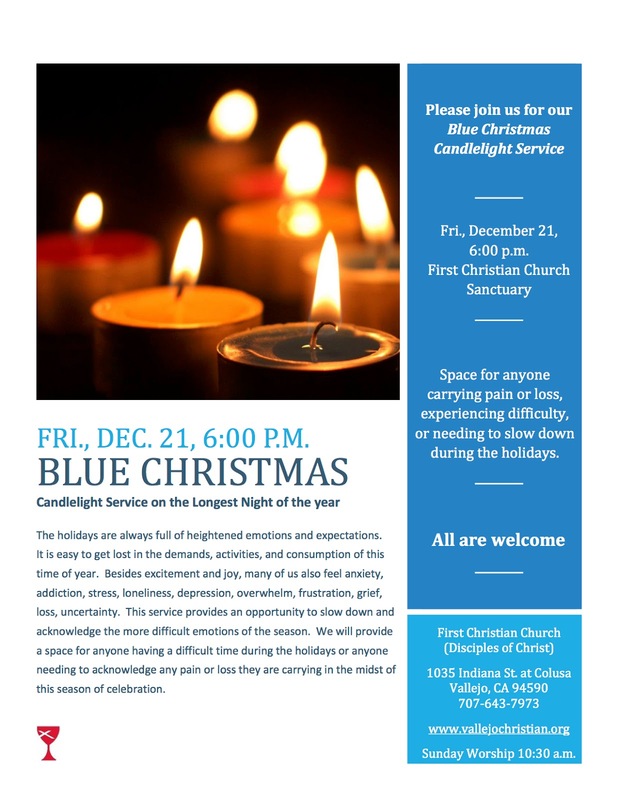 At our Blue Christmas Service, we create a quiet, peaceful, and supportive place where you are invited to slow down and recognize the more difficult emotions you may hold—anxiety, stress, sadness, loneliness, depression, overwhelm, frustration, grief, loss, addiction, uncertainty. We will provide a space for anyone having a difficult time during the holidays—anyone needing to acknowledge some pain or loss they are carrying—and anyone simply needing to take a long, deep breath and slow down—in the midst of this season of celebration. All are welcome to join in this beautiful and contemplative candlelight service, which will be held in our sanctuary on Friday, December 21, at 6:00 p.m., the Winter Solstice, the longest night of the year.